Why Is GameTruck the Best for Laser Tag Parties? 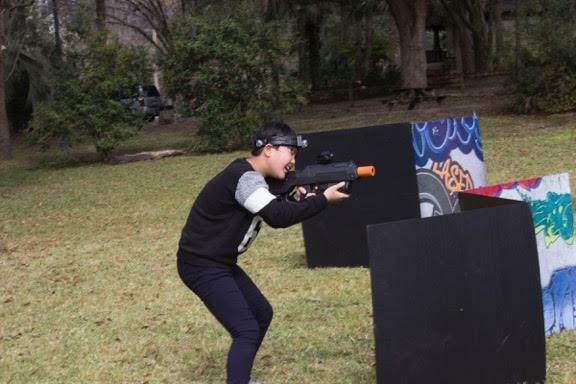 Blog » Jacksonville » Why Is GameTruck the Best for Laser Tag Parties? If you’re looking to host an exciting mobile laser tag party, look no further. GameTruck Jacksonville offers advanced technology laser tag equipment that makes for an unforgettable party. In addition to our incredibly accurate taggers, our experienced GameCoaches deliver the excitement directly to your doorstep by transforming your yard or park into an epic battle arena. GameTruck powered LaserTag offers an exciting outdoor adventure game that gets your kids off the couch and running around outside with their friends. Bring the thrill of a video game out into the real world with GameTruck Jacksonville’s next-generation LaserTag. Our taggers feature 30mm red dot scopes for crazy accurate tagging. Our high-quality optics means that if you can see your opponent, you can tag them up to 300 feet away! Long gone are the days of clunky vests and heavy laser tag equipment. GameTruck’s LaserTag equipment is lightweight and comfortable, allowing you to duck, dodge, and tag for hours. Our precision optics mean you and your friends can play either outdoors or indoors, day or night. You will be amazed by how much more exciting laser tag is with our advanced technology. One of the greatest aspects of a GameTruck mobile laser tag party is how convenient it is. You just tell us the location where you want your event to take place and we show up prepared to convert it into a modern arena. Our GameCoaches are experts at converting virtually any space into a thrilling laser tag arena, complete with obstacles in a range of shapes and sizes to add depth to the game. GameTruck powered LaserTag offers a wide range of game types to suit every guest. You can choose to split everyone into groups for team-based adventures or pick an intense free-for-all. Our advanced technology allows for up to 16 players to play at once, which makes it perfect for events of any size. The games are meant to be quick, keeping the experience fresh and providing everyone with an opportunity to play. Our trained and fun-loving GameCoaches manage the entire party for you from setup to cleanup. In addition to transforming your space into an arena, our GameCoaches referee the games, ensuring that every guest is safe and has a blast. Booking and hosting a party with GameTruck Jacksonville is simple and hassle-free. From the moment you first call us, we start planning your LaserTag party to ensure everything runs smoothly from start to finish. GameTruck Jacksonville specializes in throwing memorable parties that your guests will be talking about for weeks. Over the years, we have developed a reputation for being the most reliable mobile laser tag and video game business in the area. Our commitment to reliability, safety, and communication makes us the best in the business. Our equipment is always clean, up-to-date, and ready for hours of play. When you book a LaserTag or video game party with GameTruck Jacksonville, you can count on us to show up as promised and throw the ultimate party. GameTruck Jacksonville brings you the thrill and speed of paintball without the pain, mess, or cleanup! We are dedicated to throwing exciting and memorable parties. When the LaserTag battles are over, your guests can head over to one of our state-of-the-art mobile video game theaters for hours of fun. GameTruck Jacksonville’s no-hassle parties and events are easy to host and are the perfect way to celebrate a special occasion. To learn more about GameTruck powered LaserTag or to book an event, contact GameTruck Jacksonville today at (904) 900-0880.